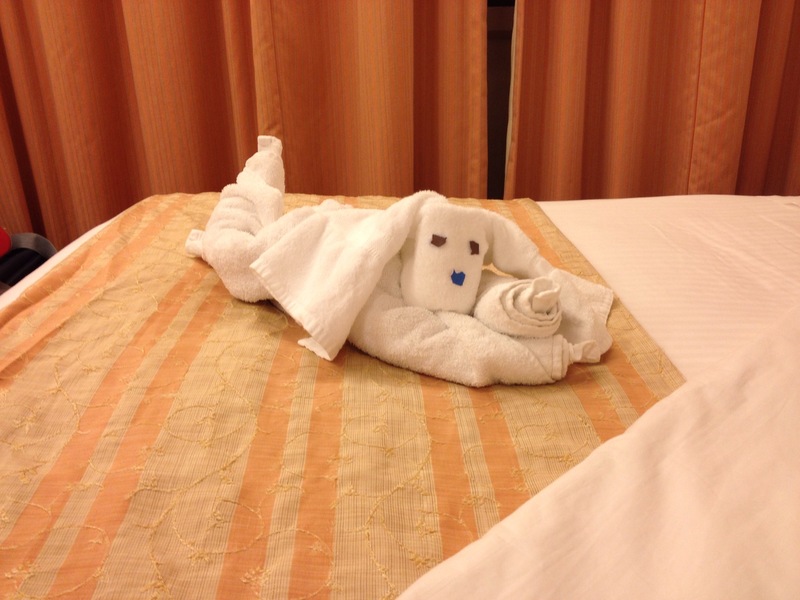 Every evening, there is a cute surprise waiting on our bed in the stateroom, namely: a towel animal and two pieces of chocolate with a caption “Sweet dreams”. 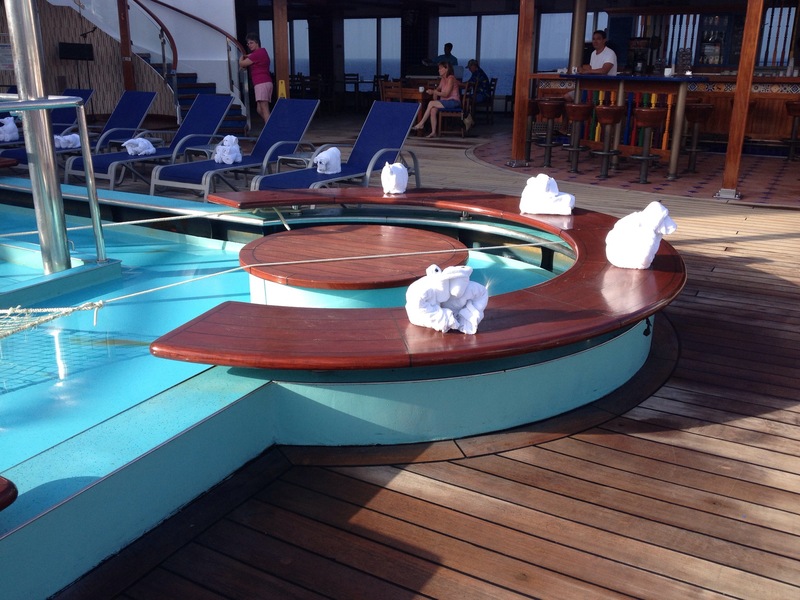 On the last day of our cruise, the lower deck of Lido was full of those cute towel animals sitting on deckchairs. It looked like a toy shop full of white fluffy toys. On the final night of the cruise we had a chance to see a live performance, namely a musical connected with the American rock music of the 70s and 80s. There were not many people in the audience, but those who decided to experience a little bit of culture really enjoyed the songs and the dancing. The most impressive were the special effects such as laser projections, small explosions and fires and the lights. Americans have two passions: food and shopping. They love spending money and buying unnecessary gadgets such as T-shirts, baseball caps, jewellery. They buy perfumes, watches, alcohol, cigars and cigarettes. They believe in every sale or price reduction. Today, on the last cruise day, they are swarming in shops buying everything there is on sale and they are sure that they make good deals. For Americans, Mexican food is something ordinary, available on every corner. 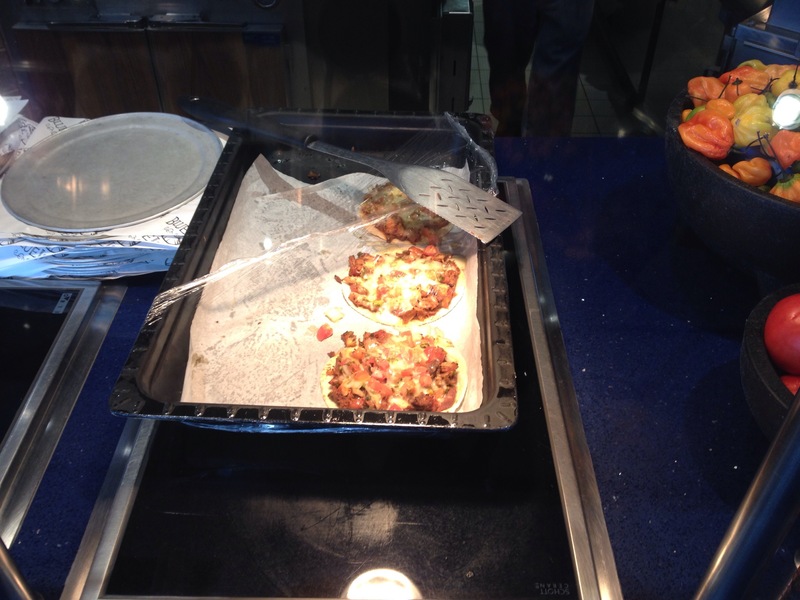 For us, it is a little bit new, that is why we decided to try taco. (A kind of pancake made of corn flour with cheese, meat, vegetables and sauses). Up till a visit to Grand Turk, Thailand was our pick and number one when it comes to beaches and the sea. Well, now Grand Turk is the winner. Nowhere have we seen so clear water. In Grand Turk, the ship docks very close to the beach. Actually, two cruise ships can dock in Grand Turk at the same time. We disembarked at 11:00 am and stayed on the island to 4:20 pm. We planned to stay on the beach or to find a local travel agent offering a trip to see the stingrays. In Grand Turk, a man with a boat found us. He offered us a trip to see the stingrays as well as some snorkelling. The price was good, $45 per person. The Carnival prices were $60 and $70 per person. There were 18 people on the boat. The beginning was not pleasant because it turned out that we would not see the stingrays. I was incredibly disappointed. The boat owner made me furious so I demanded the return of the money. A Dutch couple supported me a little bit and fortunately, the boat owner promised to take us to the stingrays. 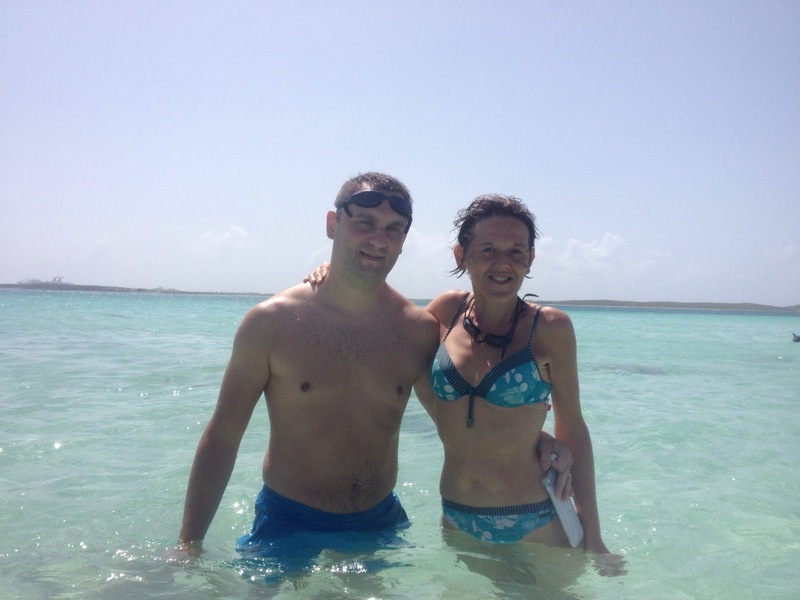 The trip with a local boatman began with snorkelling. The first location was awesome, as in the water there were sharks. It was not very deep, about 5 meters but from time to time you could see the incredible Nurse Sharks swimming close to the seabed. The second location was a little scary for me. The general depth was about 10 meters but there was also an underwater precipice with dark blue water nearby. My fear of hights was activated but this time it was conntected with water depth. 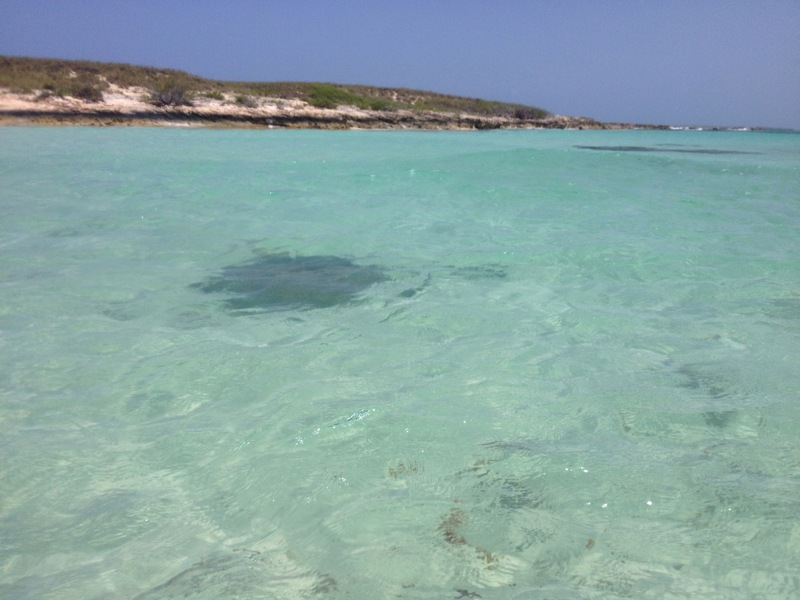 The highlight of our trip was a visit to Gibbs Cay, a place famous for stingrays. To get there, we had to swim by boat for about 30 minutes. The sea was a little bit rough so we were totally wet. When we arrived, we saw an uninhabited island with clear water and many stingrays floating like magic carpets. 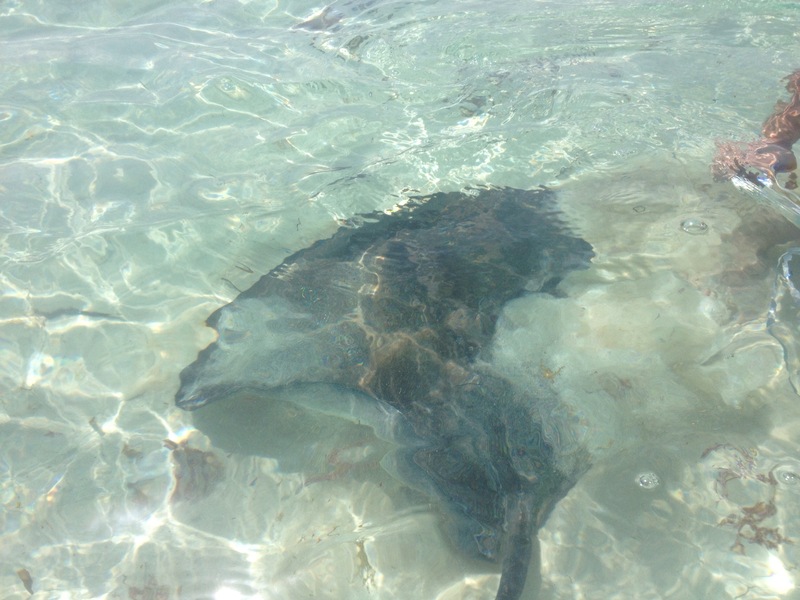 The water was warm and shallow and the stingrays were literally everywhere. We could touch them. They are soft and have very big eyes. There is only one rule connected with the stingrays: do not approach them from the back and do not step on them. When we returned to the beach, we spent some time in Margarita Ville which is a kind of pool complex near the beach. There we had an opportunity to use free Wi-Fi. 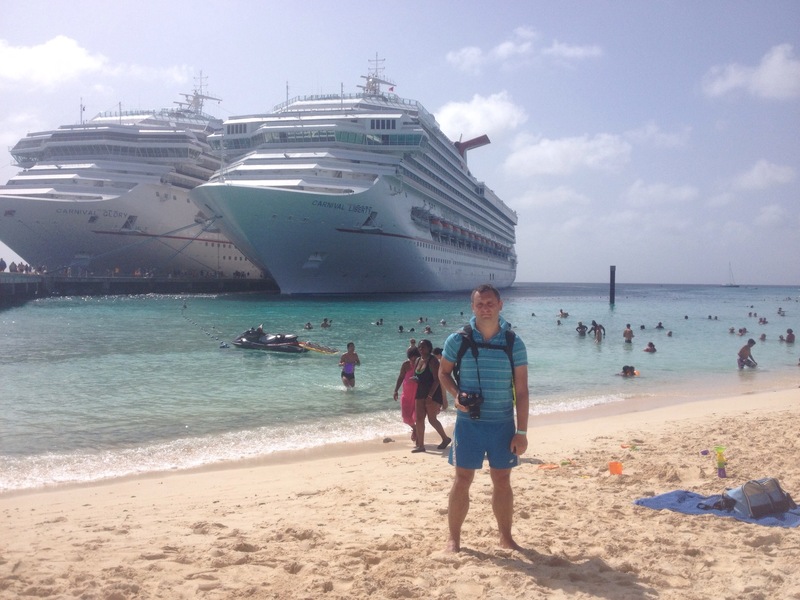 The day spent on the island of Grand Turk was fantastic. We will always remember about the sharks and stingrays. Every evening the Lido deck changes into a movie. There are two showings every night. Up till now we watched two films: “The Vow”, about a young woman who has lost a part of her memory in an accident and does not remember her husband and friends and “Diana” depicting the few last years of The Princess of Wales. The first film was really good and worth watching, the second was incredibly weak. We did not like the actress who played Diana. The plot was rather dull. When you decide to watch a movie under the sky, you can do it on a chair, deckchair, in a pool or in a jacuzzi. The sound quality is really good. Although I am not a person who loves celebrating and showing off, I suppose it would not cost a fortune to be given a small Carnival gadget or a piece of cake with a candle on my birthday. I must say that during supper one of the waiters wished me “happy birthday” and I appreciate it, but maybe it is worth changing the birthday policy a little bit. The Internet access on Carnival is really expensive, that is why people look for restaurants ashore with free Wi-Fi. 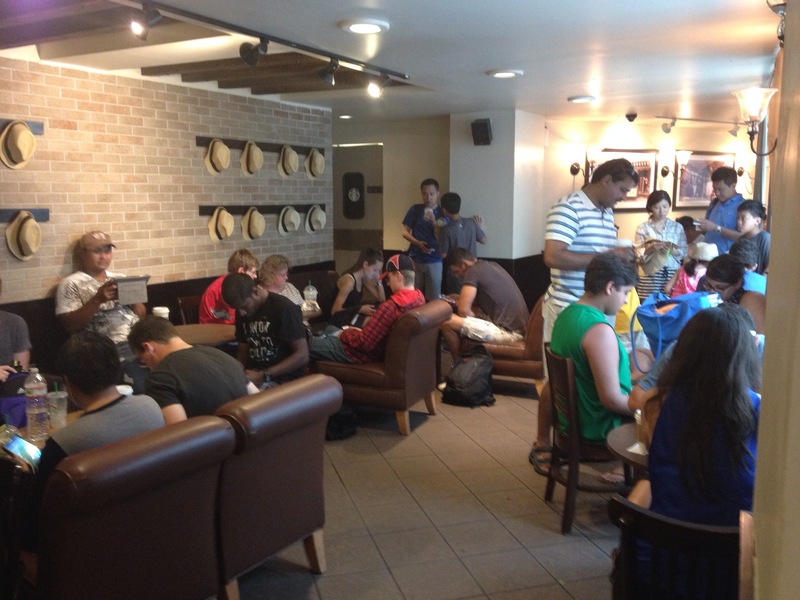 In Puerto Rico, a place with a really fast and free Internet access is Starbucks. It is located maybe 300 meters from the ship terminal. We found Starbacks easily, bought some beverages and searched for a place to sit. The restaurant was packed with people addicted to the Internet. Fortunately, we had a chance to check e-mails and send some messages home. A meeting with an artist. While in Old San Juan, we were invited to an art gallery of Mr Labiosa. We had a small talk and were given a little gift. It is hand-painted postcard showing the Island of Puerto Rico. 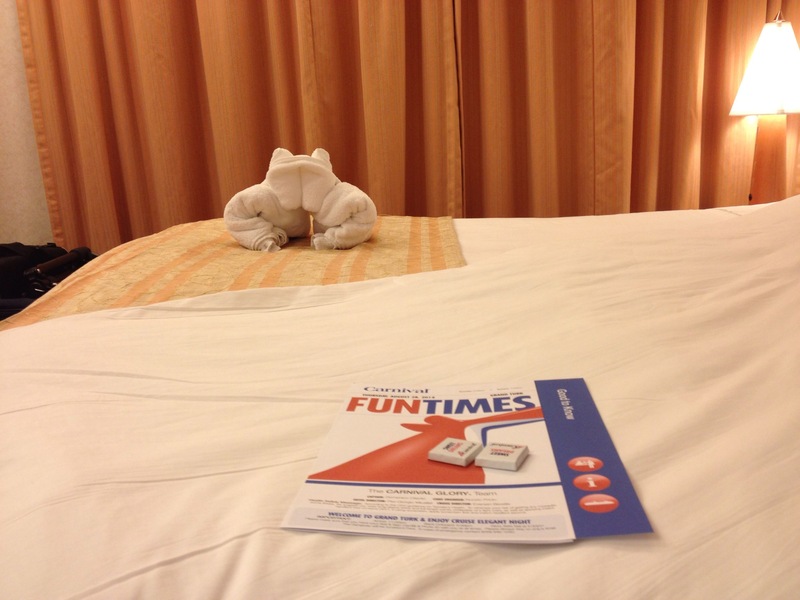 While on the Carnival Glory, it is impossible not to hear or see the cruise director. It is a cheerful young man who signs, performs on stage, hosts different quizes and is simply responsible for enertainment and fun on the ship. For me and Marcin, he is a really postive person here. Each of his announcement is followed by a cool, short song and his famous “double ciao”.